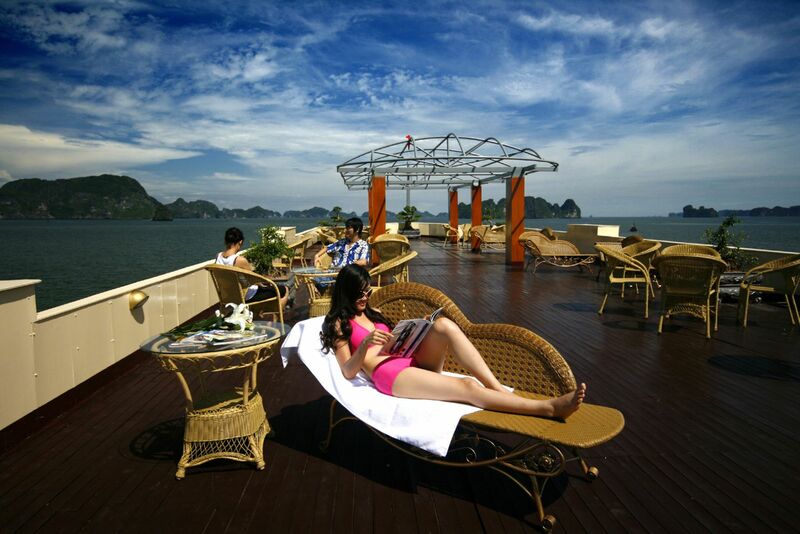 Especially, enjoy with An Nam junk, you can choose some options for you, option for visiting Halong bay, Bai Tu Long bay or visiting only Bai Tu Long bay. An Nam junk covers 5 junks ( junk with 5 cabins, 6 cabins, 8 cabins, 9 cabin and 11 cabins). * Breakfast, Dinner served on private balcony. 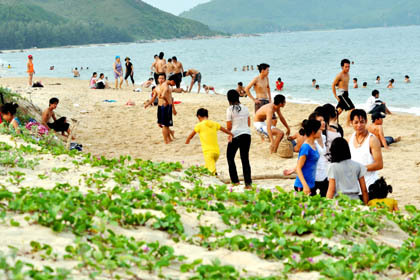 16:30-17:00: Go to Titop beach, take nice photo then visit Soisim beach. Enjoy swimming in the crystal water. 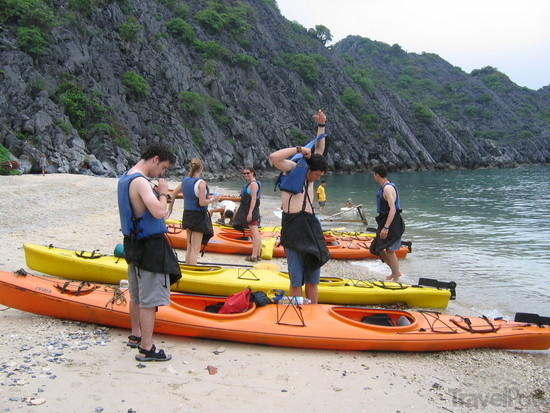 17:00-18:00: Kayak or attend cooking class on Annam junk. Watch the sunset over the bay. 18:00-18:30: Annam Junk continue going to tranquil zone “ Hang Lac” for sleeping. 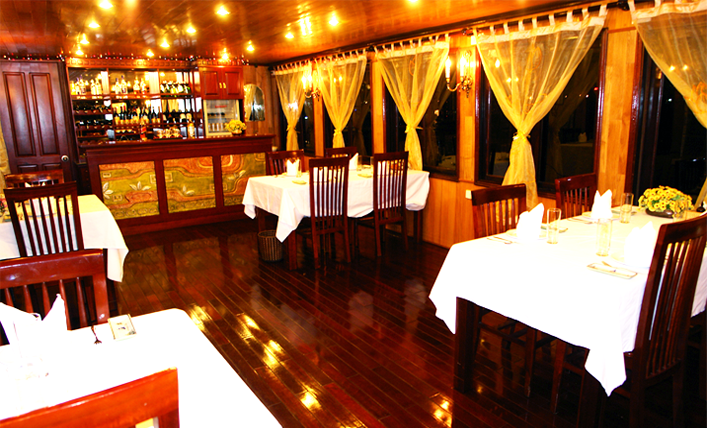 21:00: Leisure time : Film entertainment in the dining room, join squid fishing from the boat with our crew. Retire to your cabin and stay overnight on Boat Annam Junk. 9:30 - On the way back to Halong city, Annam Junk continue to explore Halong bay on the most wonderful route: Dinh Huong island, Ga Choi Island, Dog Island, Sail island. 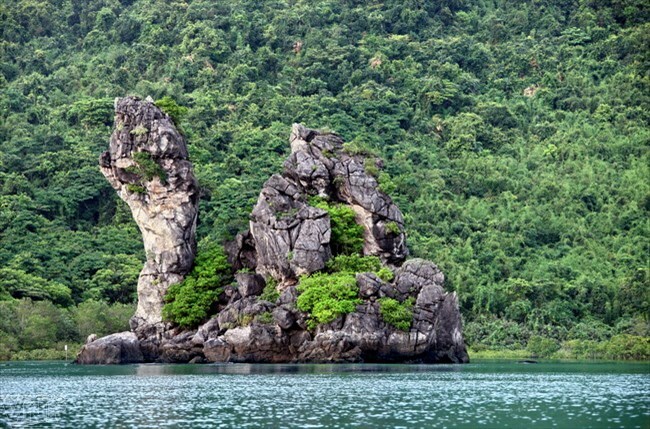 Binh Phong mountain, Man’s head island, Tortoise island. 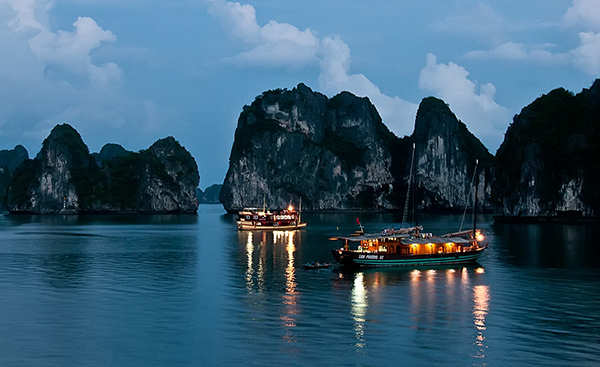 Option 2: HALONG BAY- BAITULONG BAY 2 Days / 1 Night. 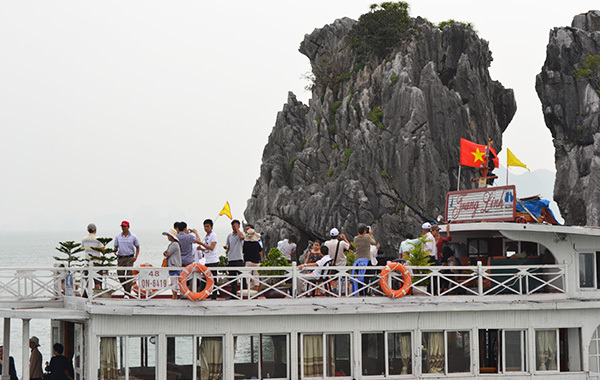 13:30-16:30: Annam Junk continues to explore Halong bay on the most wonderful route and on the way that few cruises go through: Cruising to majestic Bai Tu Long Bay, admiring several landscapes of the Bay like Oan Lagoon, Mat Quy (Monster Head), Coc Islet, Tam Cung grotto. 16:30- 17:30. 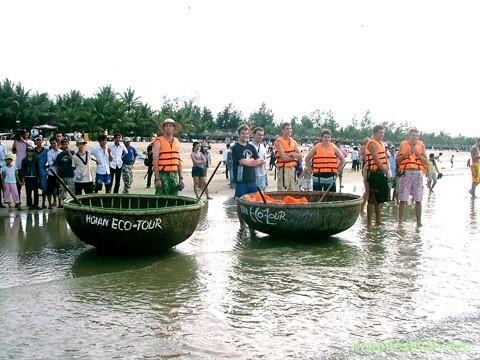 We will visit the floating fish village “Cua Van” or Kayaking Dark and Light Cave. 17:30 -18:00: You can attend cooking class on Annam junk. Watch the sunset over the bay. 18:00- 19:00: Annam Junk continue to move to Luon Bo area and drops anchor at Luon Bo where just a few cruises go through and is a tranquil zone for sleeping. 9:30 - On the way back to Halong city, Annam Junk continues to explore Halong bay on the most wonderful route: Dinh Huong island, Ga Choi Island, Dog Island, Sail island. 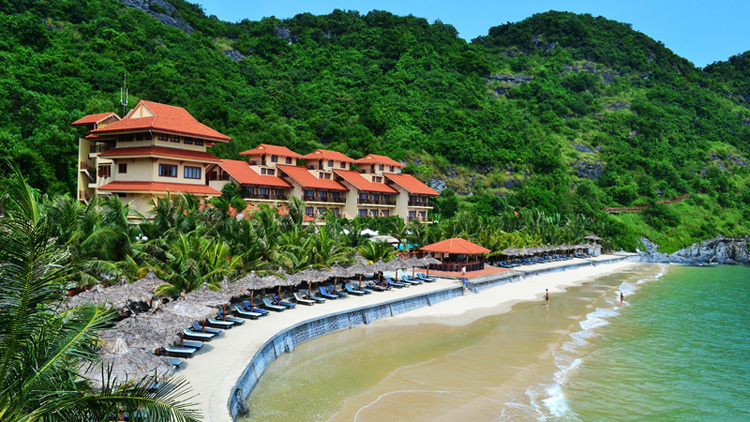 Binh Phong mountain, Man’s head island, Tortoise island. 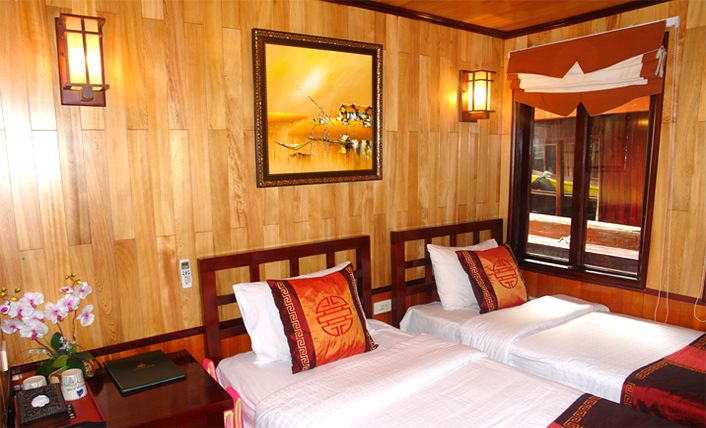 11:45 Check out Annam Junk and transfer back to your hotel in Hanoi by road. Expected tim to arrive in Hanoi is around 16:30. 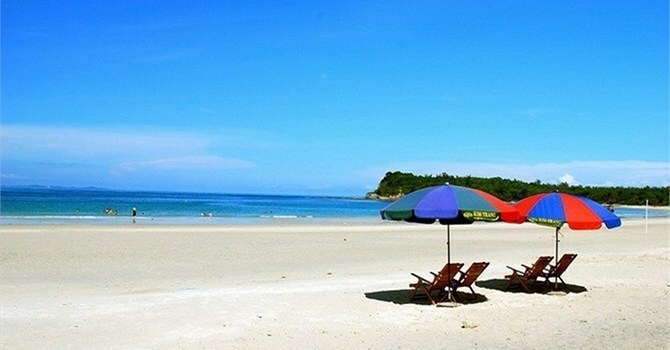 Bai Tu Long bay is a new area and authentic landscape with few tourists. 12:30: Arrive in Halong, Welcome at Baichay Wharf and check in Annam Junk. 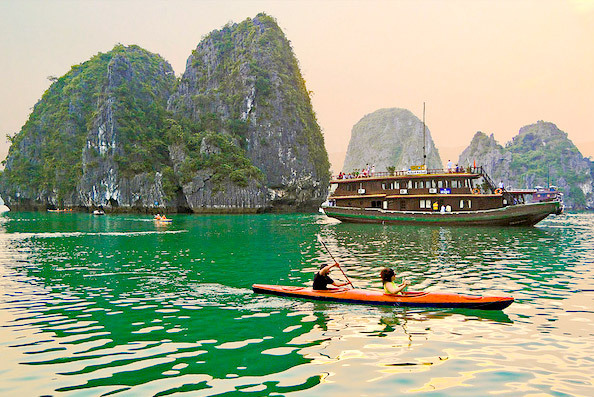 13:30-16:30: Annam Junk take you to explore Halong bay on the most wonderful route and on the way that few cruises travel through: Cruising to majestic Bai Tu Long Bay, admiring several landscapes of the Bay like Oan Lagoon, Mat Quy (Monster Head), Coc Islet, Tam Cung grotto. 16:30 -18:00: You can enjoy cooking class on Annam junk, kayak or swim in emerald water. Watch the sunset over the bay. 21:00: Leisure time : Enjoy night fishing. 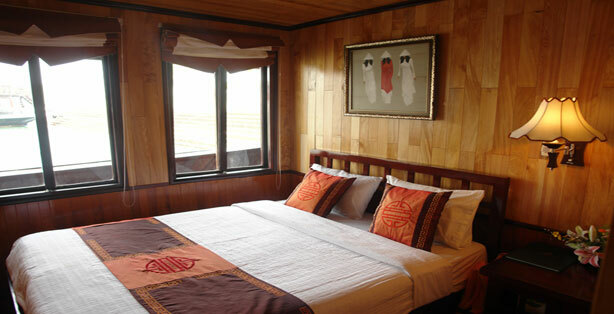 Stay overnight on Annam Junk in zone “ Cong Do”, where is of few cruises and a tranquil zone for sleeping. 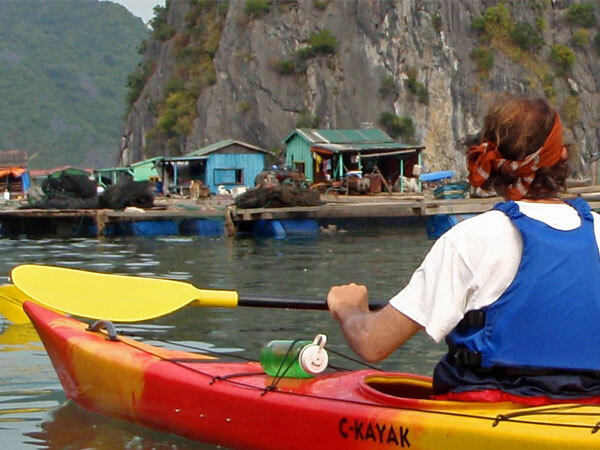 7:30 - 9:00: Annam Junk takes you to explore Bai Tu Long bay, kayak to visit floating village Vong Vieng including local houses, fish farm, school. 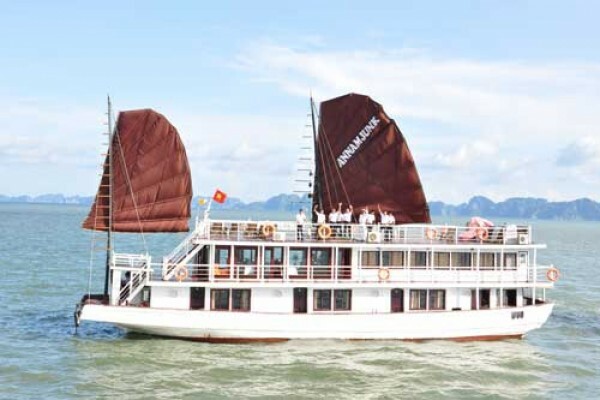 9:30 - 10:00: Annam Junk continue to visit Bai Tu Long bay on the way to Halong bay. 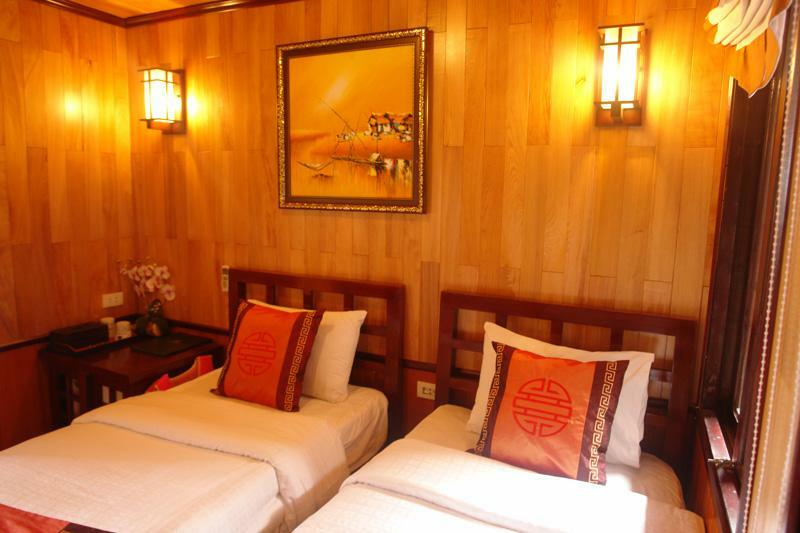 Extra cost Surcharge USD 20/person for Option 2 & Option 3 when you enjoy Bai Tu Long bay. 15:30- 16:00. 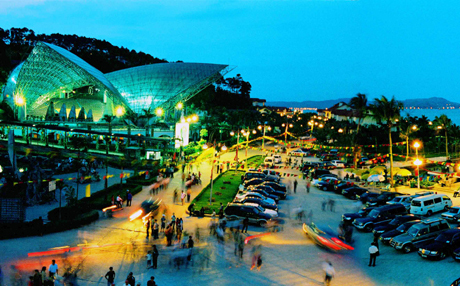 Visit Pearl village. 18:00-18:30: Annam Junk continue moving to tranquil zone “ Hang Lac” for sleeping. Wake up with famous fresh espresso coffee in Vietnam “Trung Nguyen” and enjoy the sunrise. 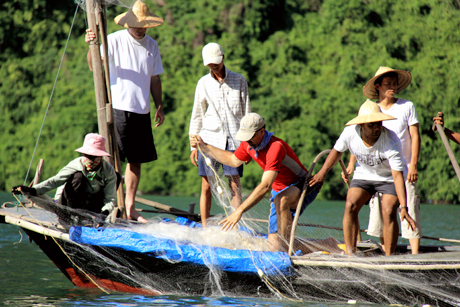 Transfer to a small boat and continue the trip to Village Cua Van, one of 8 most beautiful villages of the world. 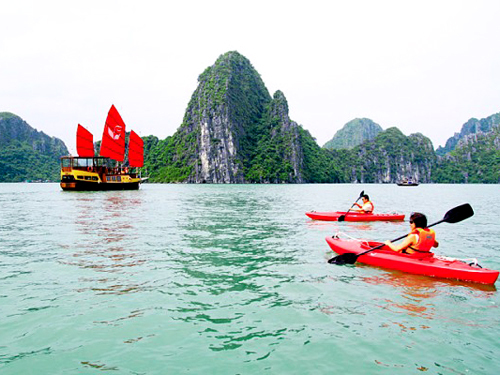 You can kayak to visit the Halong ecology Museum, " Hang Toi" cave. Have lunch with BBQ seafood on the boat. 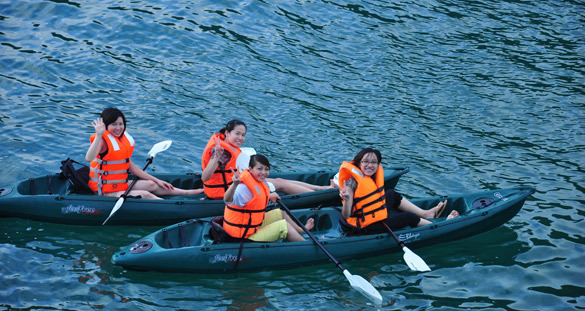 In the afternoon, relax in the boat and enjoy Halong Bay's landscape, kayak in zone of floating village Van Gia and enjoy on the beach in zone of “ Soi Sim” . 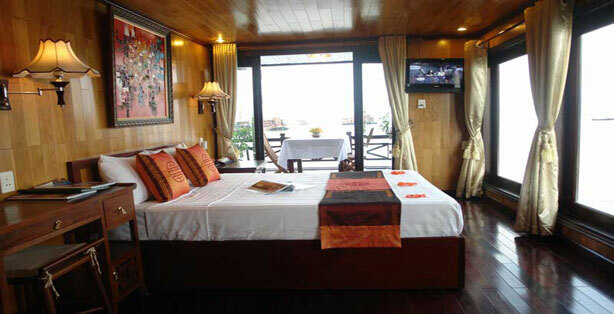 Have dinner and stay overnight on Annam Junk. 12:30: Arrive in Halong. Check in Annam Junk, enjoy welcome drink and receive cruise briefing, check-in Cabins. 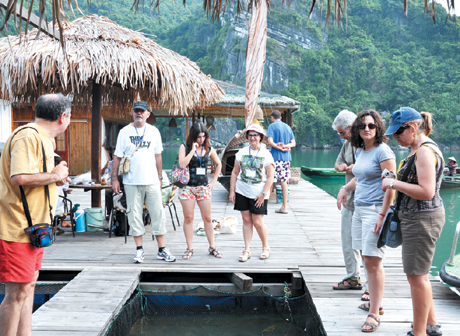 Annam Junk take you to explore Halong bay. 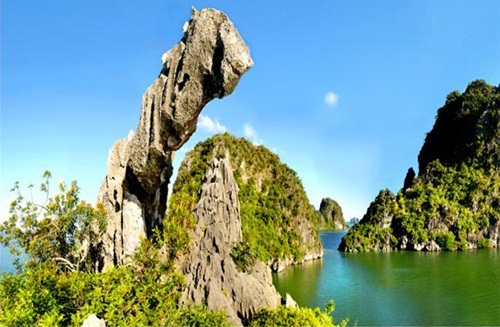 13:30-15:30: Annam Junk continues to explore Halong bay on the most wonderful route and on the way that few cruises travel through: Cruising to majestic HaLong Bay, admiring by several landscape of the Bay like Dinh Huong island, Duck Island, Dog Island, Sail island. 16:30- 17:00. Go to Titop beach. You can take nice photo of Halong bay view. Enjoy swimming in the crystal water. 17:00 -18:00: you can Kayak or attend cooking class on Annam junk. Watch the sunset over the bay. 18:00- 18:30: Annam Junk continue moving to tranquil zone “ Hang Lac” for sleeping. 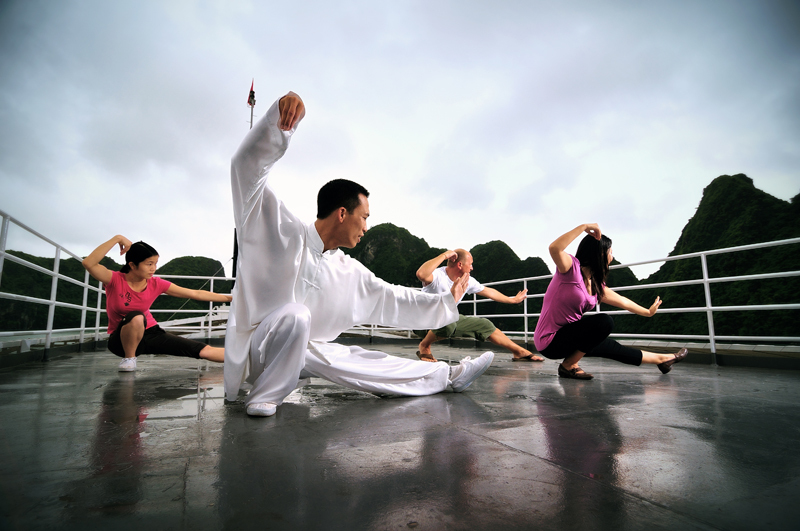 21:00 : Leisure time: Film entertainment in the dining room, join squid fishing from the boat with our crew. Retire to your cabin and overnight on boat Annam Junk. 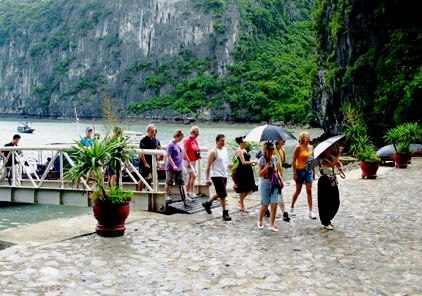 8:00: Transfer by tender to one of the most beautiful caves on Halong bay “ Surprise Cave”. Walk 100 steps up to the entrance of the cave and trek on foot for approximately 60 minutes. 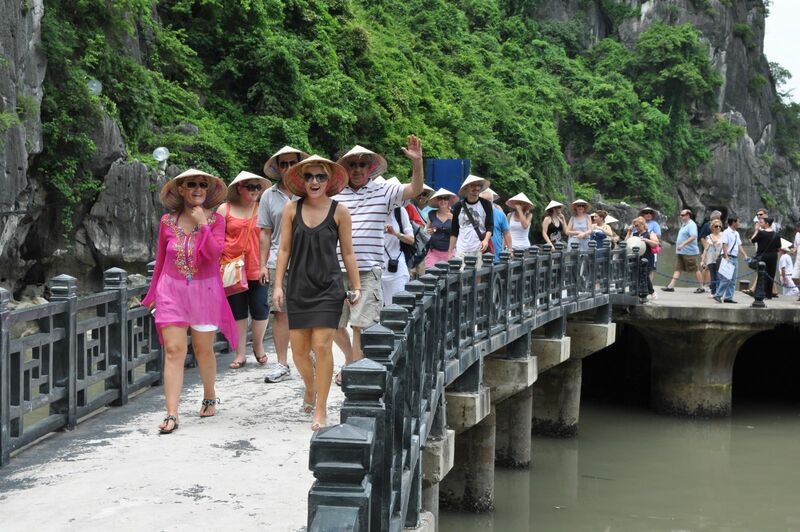 9:30: On the way back to Halong city, Annam Junk continue to explore Halong bay on the most wonderful route: Ga Choi Island, Binh Phong mountain, Man’s head island, Tortoise island. 13:15: Whilst cruising on exquisite waters, sampling the regional fresh seafood. Have a lunch. 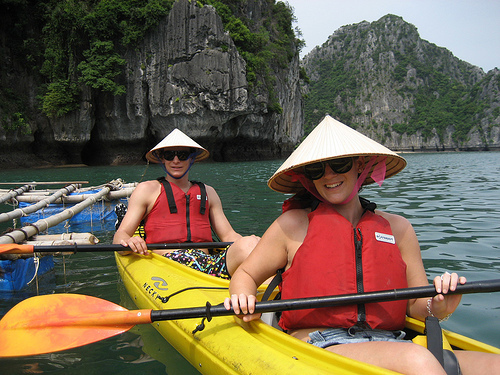 15:30-16:30: Annam Junk explores Bai Tu Long bay, kayak to visit floating village Vong Vieng including local houses, fish farm, school. It is a wonderful floating village in the world. 16:30 -18:00: You can enjoy cooking class on Annam junk. Kayaking or swimming in emerald water. Watch the sunset over the bay. 21:00: Leisure time: Enjoy night fishing. Overnight on Annam junk in zone “ Cong Do”, where is of a few cruises and a tranquil zone for sleeping. 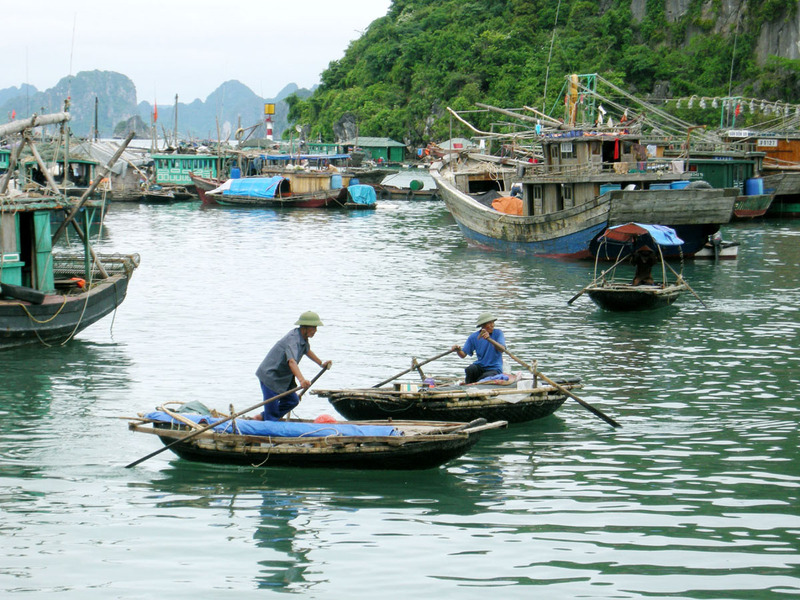 8:30 - 10:00: Annam Junk continue to visit Bai Tu Long bay on the way to Halong bay. 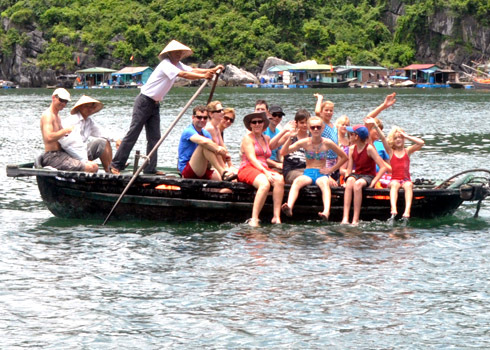 13:30-15:30: Annam Junk continues to explore Halong bay on the most wonderful route and on the way that few cruises travel on: Cruising to majestic HaLong Bay, admiring several landscapes of the Bay like Dinh Huong island, Duck Island, Dog Island, Sail island. 16:30- 17:00. Go to Titop beach. 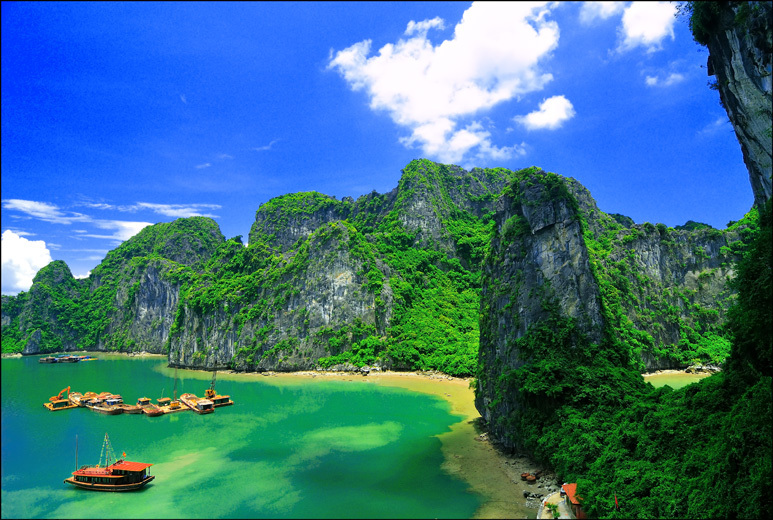 You can take nice photo of halong bay. Enjoy swimming in the crystal water. 18:00- 18:30: Annam Junk continues moving to tranquil zone “ Hang Lac” for sleeping. 7:00: Wake up with famous fresh Vietnamese espresso coffee - Trung Nguyên, cake and tea for breakfast. 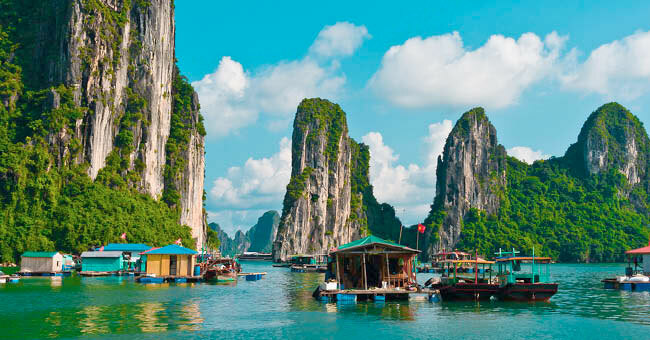 Enjoy the sunrise; go swimming in the emerald waters of Halong Bay. 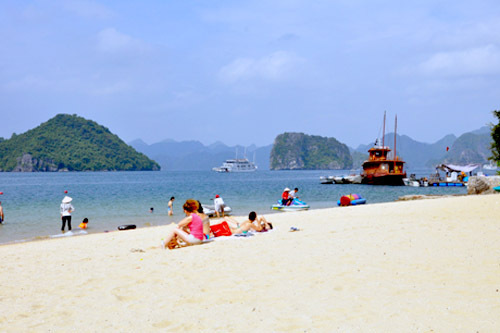 9:30: On the way back to Halong city, Annam Junk continue to explores Halong bay on the most wonderful route: Dinh Huong island, Ga Choi Island, Dog Island, Sail island. Binh Phong mountain, Man’s head island, Tortoise island. 10:00: Check out cabin on the way back to Halong city. From Hoa Cuong Island, tender transfer to Gia Luan Dock in Catba Island for about 40 minutes. Transfer to Catba town (join in group). 12:00 Check in Hotel. Have Lunch in Hotel. Free day visit Caba Island. Stay overnight in Holiday Catba Hotel . 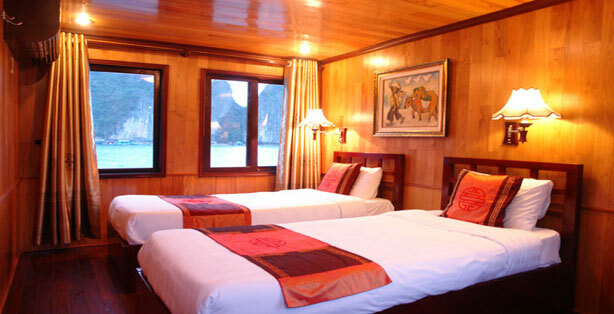 Extra cost Surcharge USD 30/person for Option 2 & Option 3 when you enjoy Bai Tu Long bay.